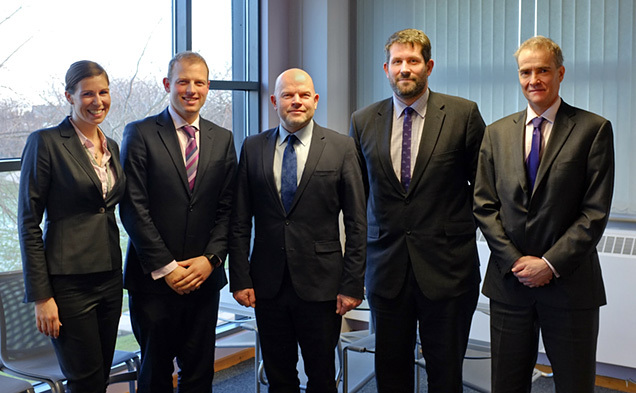 Charlie Taylor met with 4 heads from the Gorse Academies Trust in Leeds. In a wide-ranging conversation, they discussed the impact of teaching schools, School Direct and school-to-school support and how the aspirational culture of their organisation is driving leadership development across their schools. You can listen to the full audio recording of the interview at the bottom of the page. What does it mean for you to be a teaching school? John Townsley: I suppose for us, it's the formalisation of our position as a highly successful organisation. And, that we are in a position to be resourced to strategically support the improvement and development of other schools in a way that sticks, in a way that is profound and deep rooted. In particular - and I think this is always the majority of schools – we support those that want to improve and are keen to get involved in that process. For us, that’s the biggest part of what teaching schools are about. We’re also very keen on CPD, leadership development and the development of young teachers coming into the profession. So for example, the development of our SCITT - which begins formally in September 2015 and into which we are recruiting now - is a principal part of our identity and something we see as not just being of importance to the Gorse Academies Trust, but also of importance to the Leeds city region in terms of bringing great teachers into this area. John Ziltener: I think that support has been incredibly important in terms of Farnley's journey, because in 2009 Farnley was an inadequate school and by 2013 we were judged to be outstanding. People often ask: how did you do it? And it’s all about talent, isn't it? It’s about having a talent-focused organisation. I think the fact that we are able to bring trainees in right at the start of their careers and develop them through School Direct and ensure that they can teach at the level that’s required is really important. And in fact we've employed now a large number of our School Direct trainees, because of the calibre of those candidates and the impact they have had on our students and student performance. So it’s been hugely beneficial to us as a school in that respect. Andrew Midgley: Going forward, we are going to look at this from a primary point of view and that’s quite exciting because I’m seeing how well it’s working at Morley, at Farnley, the impact that it’s having. I've been part of a School Direct group before and have worked with Leeds Met University as an associate lecturer, so I’m sure that primary will follow the same sort of pattern. So, we will be recruiting young, high calibre, passionate people into the profession that can then drive the standards forward for our children. So it isn't just about offering someone teacher training, you’re actually offering people careers here within the trust? John Ziltener: Yes, and I think our School Direct candidates recognise that. So, when they begin working with us, many of them express an interest in remaining part of the Gorse Academies Trust, because we have created an organisation which is highly focused on CPD and which I think challenges people to develop rapidly in their own careers. When Farnley was inspected in 2013, 98% of our NQTs were judged to be teaching at an outstanding level and that reflects the quality of professional development that they receive, through the teaching school. John Townsley: And the meritocracy of it is critical because that means that we end up with wonderful directors of science, of mathematics, of English, key leaders in the primary phase in the future, who are very young, very able, but have been given fantastic guidance and support within the trust. What has being a teaching school done for Morley? John Townsley: Morley first became involved in really significant school-to-school support in 2007, prior to becoming an outstanding school. That was in support of Rodillian School, which is also in the south of Leeds. I was constantly, along with governors, challenged about what the consequences of that involvement might be. But what it actually caused – as well as me becoming, I think, a better leader as a result of that involvement – was others to take greater responsibility for themselves as leaders with me not being around. Greater capacity and professional effectiveness was established over the course of that 2 years and it came as no surprise to me when we moved straight from satisfactory to outstanding in 2009. The involvement with Rodillian was absolutely critical to that. I would say that people need to look really carefully at geographical proximity. Rodillian is a 10 minute drive from here. Farnley is a 10 minute drive from here in a different direction. So it is very easy for a national leader of education to move around, but also for colleagues to come across and work together and work alongside each other. So passionate are we about [school-to-school support] now, that we have a national leader of governance, who is very important in our work and we are seeking to push forward with a separate teaching school alliance. So we see the development of the expertise of others as being central to our own model of an improving school in our own rights. As a teaching a school and multi-academy trust, how have you been able to encourage people to become leaders and develop people’s leadership skills? John Townsley: Well, I suppose the leadership skills and the development of leaders is certainly evidenced by John and Rebekah who are here today. John applied for and became the head of geography at what was Morley High School in 2005. Becky was previously an assistant headteacher at Farnley Park High School. Both of them, through what I believe to be very high-quality, personalised support and development, have moved on to become truly exceptional leaders of organisations in their own right. So I agree with your view that it is very much about whether an organisation is looking to do that. Well, we are. We are always looking to see where that talent is. I also agree that, not just within Gorse but nationally, there is a rich seam of talent – it's about whether we can develop it. What also happens – and I think that is represented by Andrew – is that great organisations then attract great people and that actually is a great challenge for the system. Because if we are not very careful, to use a fairly unpleasant analogy: ‘money will make money’. So the more powerful, the more repute an organisation has, the more people like Andrew will be attracted to becoming a part of it. But of course what that means is, areas that are in need of that great leadership, have little going for them. I think that is a really big part of our next, national agenda. Charlie Taylor: That’s right, but I think that the fact the trust is taking on schools in difficulty, means that you’re addressing that issue. John Ziltener: I think it is also about the aspirational culture of the organisation. John Ziltener: We’re highly aspirational for young people and I think that we are also highly aspirational for our professionals. They believe in themselves and believe that they have the ability to become leaders. Sometimes we have to hold them back a little bit, because they are very keen to move into senior leadership, sometimes in their second year of teaching! And we have to talk to them about making sure that you do master your craft and develop your craft first in the classroom or at middle leadership level. We do have a very ambitious team of staff, but we do create a huge number of opportunities for them to develop as well. Rebekah Taylor: I think that's it, the beauty and advantage of the trust is that actually there are those opportunities there that retain them within a trust that actually provide them with their own professional development, but actually there is also a safety in knowing that we have a consistent set of standards across all of our academies, primary and secondary. And you know what it is that you are walking into as a leader and you have a familiarity – that is really key. John Ziltener: You are also learning from leaders that have got a very strong, proven track record, and obviously Sir John is at the top of that, and is ultimately the person that we have all learnt from. When I started as an acting headteacher, the relationship that I had with John was absolutely crucial, along with the level of mentoring and coaching I received on a daily basis. Now I am able to share that with others and we have a distributed approach to leadership. We have very clear structures in place within our organisations that leaders can operate within. But they also have very high levels of accountability so they develop at their level and are able to move and are empowered to move into senior leadership when they’re ready. Andrew Midgley: I've worked for an outstanding headteacher and had 7 years’ experience as a headteacher in my own right before I came to the trust. The opportunity of coming and working for Sir John and the Gorse Academies Trust, it was something I couldn't not look at. The inspirational and aspirational people that John alluded to earlier – they are there. I've only been here since September and I've met colleagues who are breathtaking, with what they can bring and provide to my little primary school. I am able to go and meet with these colleagues and we meet regularly as a group of principals as well. It’s fantastic – even though I’m experienced, I’m learning so much. John Ziltener: And it’s not just about teachers either; it’s also about our support staff, who make a huge difference to a really effective school. They share that sense of aspiration, and they are very, very proactive. We see it more and more that they are developing systems and approaches that are at the leading edge in their line of work. So leadership is something that you are expecting from people the whole way through the hierarchy of the school? Rebekah Taylor: We expect it from our students too; we have a strong focus on that. John Ziltener: I think we make it very clear to everybody that they are a part of what we are achieving. So you know, regardless of which part of the organisation you’re in whether you’re a member of the finance team or a cleaner, you are making a difference to young people’s lives. And that message and that vision permeates all aspects of the organisation. (b) limited opportunity for 'grow your own staff' to experience life in different types of organisations, so only grow within their organisation. (d) appears to reduce creativity or spontaneous development within a school - generates a corporate style of uniformity. Good for schools coming out of special measures but not for others.